Draft has two elements; the depth of draft and position of draft. Generally you use flatter sails with less draft in stronger winds and fuller sails with more draft in lighter airs. However, the depth also changes according to the wind direction; full sails for reaching and running, flatter sails when you are on the wind. The depth of draft is adjusted by mast bend and clew outhaul. Increasing backstay tension on a fractionally rigged yacht pushes the middle of the mast forward and pulls the top backwards. This moves the luff away from the leech, flattening the central and upper parts of the mainsail and reducing the draft. 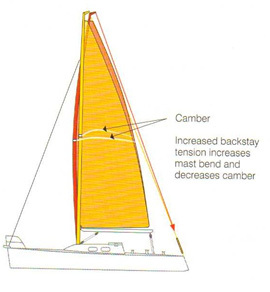 Decreasing backstay tension will straighten the mast and increase the depth. Adjusting mast bend on a masthead rigged boat is often not possible on passage. 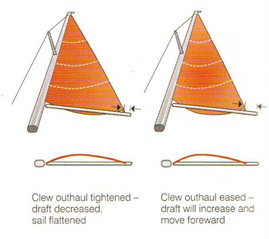 The clew outhaul controls the depth of the lower parts of the sail. Increased outhaul tension flattens the sail for heavy winds, easing the outhaul allows a fuller sail for lighter airs. 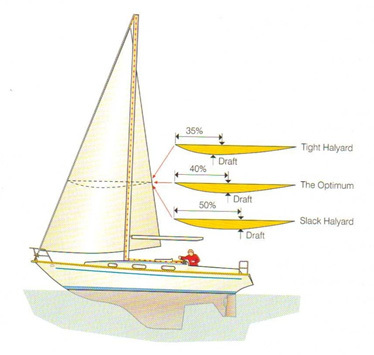 Flattening the lower part of the sail also increases twist, helping to reduce heeling and weather helm. The depth of draft is adjusted by forestay tension. This is easy to adjust on a masthead rigged boat if there is an adjustable backstay and to a lesser effect on fractional rigged boats. 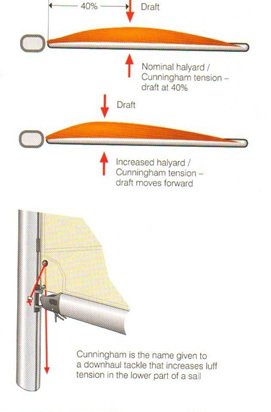 A tight forestay reduces draft and a saggy forestay increases draft and also changes the angle of attack of the sail to the wind. A tight forestay will give a flatter sail with a fine entry to the wind. A looser forestay will give more depth to the sail with a rounder entry to the wind. The position of the draft in the sail changes the entry angle of the wind onto the sail. It constantly moves as the wind strength changes and therefore requires adjustment. Luckily this is easy to do. Draft position is adjusted using the halyard and cunningham. Ideally the draft is set and is kept at about 40% -50% away from the luff. 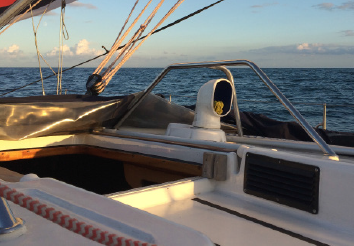 However, as the wind strength increases, wind pressure will move the draft aft and the halyard will require tensioning to move the draft forward once again. Old sails show their age because more and more halyard tension is required to maintain the draft correctly positioned. Draft moves aft with age and increases weather helm especially in moderate to heavy conditions. 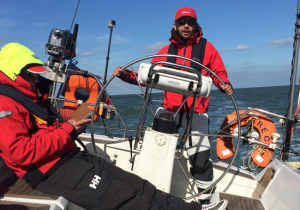 In light winds it is often advantageous to move the draft aft by slackening the halyard. 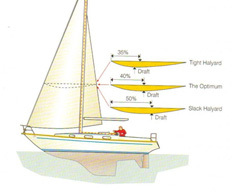 Using the cunningham rather than the halyard has the advantage of pulling down on the sailcloth instead of the boltrope, therefore less effort is required for the same effect. 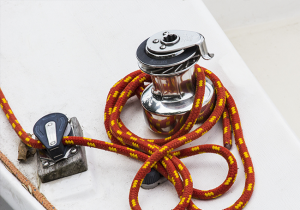 Tightening the genoa halyard will move the draft forward. Easing the genoa halyard will move it aft. Draft forward gives the genoa a rounder entry which means that a sail is more forgiving of course alterations especially when sailing close hauled and in lumpy seas. Moving the draft aft gives a finer entry, which is better for pointing ability in flat sea conditions. 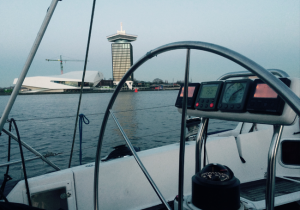 Remember to loosen the halyard tension on furling genoas before you go home.